Designed by Italian Tommaso Rumici (Viper DAN, DPX HEFT, etc.) 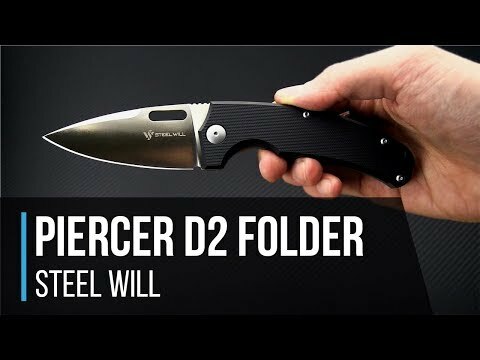 Steel Will Piercer is a mid-size every day carry with versatility to handle tasks from trimming threads to self-defense and everything in between. The wide full flat ground blade makes it an excellent slicer while the top swedge ends in a fine point that helps the Piercer live up to its name. 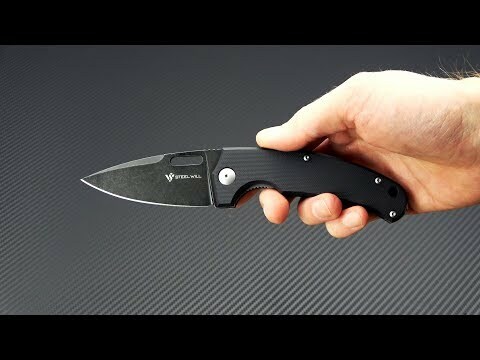 This version comes with a black stonewashed D2 blade, dual black G10 scales and stainless steel liner lock. Blade: The D2 tool steel blade is capable of some serious cutting with a wide, 3mm thick blade that is fully flat ground for optimal slicing performance. The swedge that runs more than half the blade length tapers to a fine tip that delivers powerful piercing performance on wood, plastic, thick cloth and more. It opens smoothly via the generous oval blade hole riding on a durable bronze washers. The blade sports a black stonewash finish that gives a discreet and rugged look that hides wear well. A well executed sharpening choil is provided for complete sharpening with ease. Handle: The clean and sweeping lines of the Piercer's black G10 handles give the knife a great look while providing a secure and comfortable grip. An index finger cutout gives access to the stainless steel liner lock mechanism; simple, robust and secure, and provides a guard to prevent sliding onto the blade. Open back construction with titanium back spacer reduces weight and makes cleaning and maintenance easy. A generous hole at the pommel end allows for lanyard attachment. Carries via a reversible, tip-up stainless steel deep carry pocket clip.